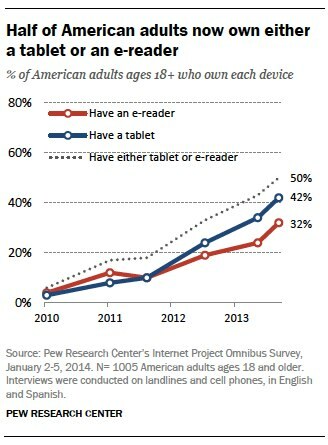 The proportion of Americans who read e-books is growing, but few have completely replaced print books for electronic versions. 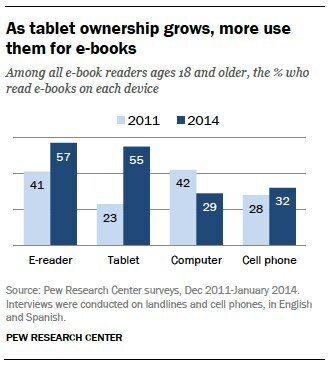 The percentage of adults who read an e-book in the past year has risen to 28%, up from 23% at the end of 2012. 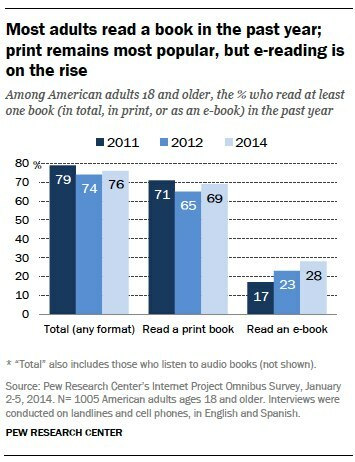 At the same time, about seven in ten Americans reported reading a book in print, up four percentage points after a slight dip in 2012, and 14% of adults listened to an audiobook. These findings come from a survey conducted by Princeton Survey Research Associates International between January 2-5, 2014. The survey was conducted among a nationally representative sample of 1,005 adults ages 18 and older living in the continental United States. Interviews were conducted by landline (500) and cell phone (505, including 268 without a landline phone), and were done in English and Spanish. Statistical results are weighted to correct known demographic discrepancies. The margin of error for the full sample is plus or minus 3.4 percentage points.